James P. "Jim" Starlin (b. October 9, 1949, Detroit, Michigan) is an American comic book writer and artist, who has worked for Marvel Comics, DC Comics and others since the early 1970s. He is best known for "cosmic" tales and space opera and as the creator of the villain Thanos. After writing and drawing stories for a number of amateur fan publications, he got his break into comics working for Roy Thomas and John Romita at Marvel Comics in 1972. Starlin, along with Len Wein, Marv Wolfman and Walter Simonson, were all part of the generation of artists and writers who arrived in comics at that time who were primarily fans of the Stan Lee/Jack Kirby Silver Age of Comics. His work was heavily influenced by the art of both Kirby and Steve Ditko. Starlin's first job was as a finisher on pages of Spider-Man. He then drew three issues of Iron Man, which introduced the character Thanos, an homage to Kirby's Darkseid character. He was then given the chance to draw an issue of a failing title Captain Marvel (issue 25). Starlin took over as plotter with the next issue and Starlin developed through the comic an elaborate cosmology for the Marvel%20UNIVERSE%20'>Marvel UNIVERSE that was much referenced by other writers. Starlin co-created the kung fu craze cash-in character Shang Chi and then began his most legendary work: a re-imagining of a minor Lee/Kirby creation, Adam Warlock. He scripted and drew a complex story-line with theological themes, as Adam Warlock, who had emerged from a kind of virgin birth, confronted a dictatorial Universal Church of Truth founded by his evil future self. After his departure the Captain Marvel title had again declined and Starlin was given, for the time, the rare opportunity to kill off the character in a graphic novel, The Death of Captain Marvel. Death and suicide are recurring themes in his work: personifications of Death appeared in his Captain Marvel series and in a fill-in story for Ghost Rider; Warlock commits suicide by killing his future self, and suicide is a theme in a story he plotted and drew for The Rampaging Hulk magazine, to give only some examples. He received recognition for his work with the Shazam Award for Outstanding New Talent in 1973. 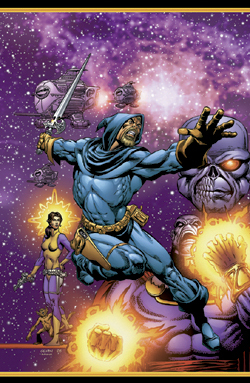 Most of the 1980s were taken up for Starlin scripting and drawing Dreadstar for Epic Comics (an imprint of Marvel Comics), and later for First Comics. In the late 1980s he switched to DC Comics and wrote the Batman:A Death in the Family story arc (in which the second Robin died) and back at Marvel for the Infinity Gauntlet storyline, featuring the return of one of his best-known creations, the mad Titan Thanos. Starlin has also written with his wife Daina Graziunas, novels such as Thinning the Predators, Among Madmen and Lady El. He worked on fill-in stories for the Legion of Super-Heroes. The final part of his Omega story line was broken into two issues (#250/251) and re-edited. Upset with the editorial decision Starlin took his name off those issues and asked to be credited as "Steve Apollo". Recently Starlin has returned to DC comics and, along with artist Shane Davis, is writing a miniseries called Mystery in Space. Also DC says that Starlin will be working on secret project for them in the future.